Disneyland, 2002, Big Thunder Mountain. We were sick while on board. Our brother nicknamed us Big Chunder Mountain for years. True Story. 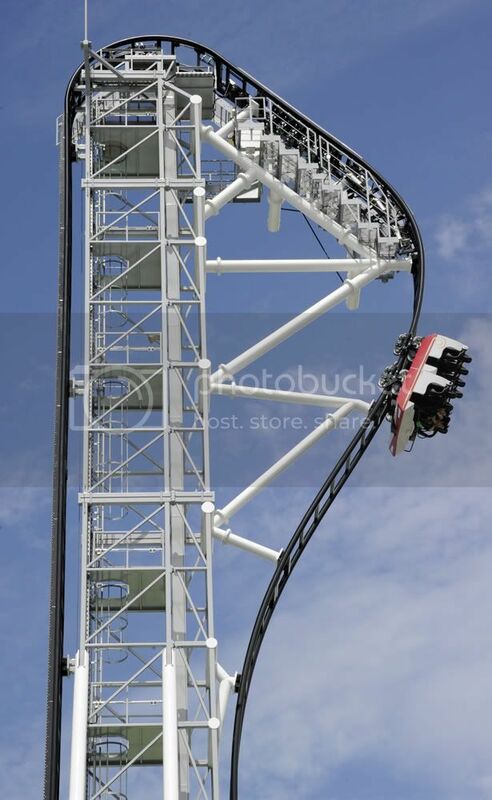 Meanwhile, in Japan, the newest addition to the Fuji-Q Highland Amusement Park in Yamanash is set to open. It's called Takabisha - the Japanese for Dominant. Hell yes. The ride lasts for just 112 seconds and boasts seven loops, with its highest point at 141 foot where thrill-seekers can, er, enjoy (?) a freefall at 121 degrees clocking up 62mph on the way down. The park forked out £25 million to build the rollercoaster, but if you’re keen to take a spin it will cost you rougly £7, excluding park admission fees (and a trip to Japan, of course). Apparently there are also great views of Mount Fuji from the ride but somehow we doubt that’s what we'd be looking at.